IBM Content Navigator enables users to access, manage and use enterprise content from nearly any mobile device, anytime and from anywhere across the enterprise. IBM® Content Navigator® enhances your business processes, improves productivity and increases customer engagement by transforming how content is accessed, delivered and presented. Content Navigator uses a powerful, easy-to-use interface that delivers trusted data quickly, no matter where the content is located or what type of data source. Content Navigator enables secure, easy-to-integrate, custom applications development and delivers a consistent experience on any device. Role-based redaction protects sensitive data while Teamspaces enable focused collaboration with powerful team and project site content capabilities. Delivers a powerful versatile application that can access and deliver enterprise content from all of your content repositories using a simplified easy-to-use interface. Enables a superior capacity to capture, access and share trusted enterprise content securely and fast. Delivers an integrated view of all your enterprise content enabling informed decision making. Provides a single platform that leverages a flexible and shareable plug-in architecture. Uses powerful industry-standard APIs to develop content solutions for both desktop and mobile devices fast. Engages your users over all content channels including social media. Delivers content anytime and anywhere, offline or online. Enhances your users ability to share and collaborate. Includes a more modern experience with hybrid options for custom plug-in development. Provides a persistent ability to capture and access key content when and where users need it. 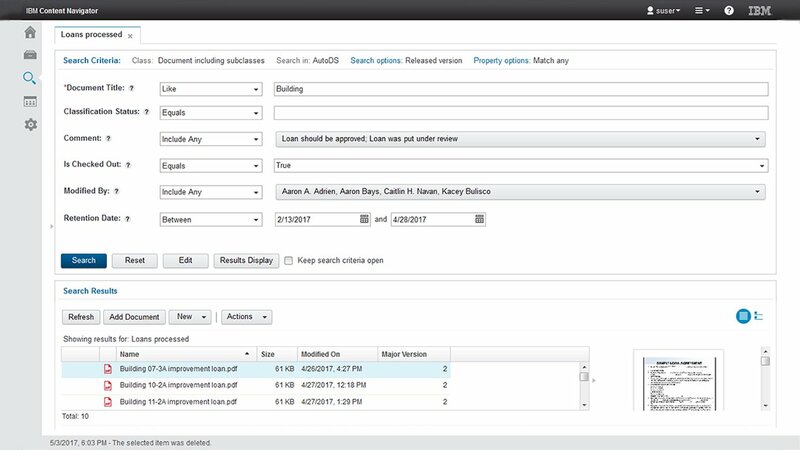 Enable documents to be redacted automatically based on the role of the requester, blocking out information according to a user's specifications.